Founder Jim Thorn hard at work with his trusty typewriter, circa early 1980s, in the three metre by five metre AA office in Manly. In September 2017 Australian Aviation celebrates its 40th anniversary. To mark that milestone we publish here Australian Aviation founder Jim Thorn’s account from the September 2007 edition of the magazine’s formation and early days. I love history and there is no better history, in a real sense, than that which one lives through. September 1977 seems a long time ago, more than half my life in fact, and in that time so much has changed both locally and internationally. At home, we have a totally de-regulated airline environment with more uplift in a month than we had for all of a year back then. Internationally a similar situation existed albeit at the expense of so many of the industry’s pioneers. The Cold War ended with a win for the good guys (thank heavens!) though the mooted peace dividend was illusionary as a ‘new’ foe seemingly from the Dark Ages makes its evil presence felt far and wide. Military aircraft nowadays seem to take forever to bring to operational status and at extraordinary cost and often don’t work as advertised when they do arrive at the front line. Fortunately their weapons do and the latest generation of smarts provide levels of precision capability undreamt of even back in the seventies. So how did AA begin? Actually it began life as Australian Aviation & Defence Review and as an annual. Though my day job was in another field outside aviation, all things aeronautical were my biggest interests since childhood. 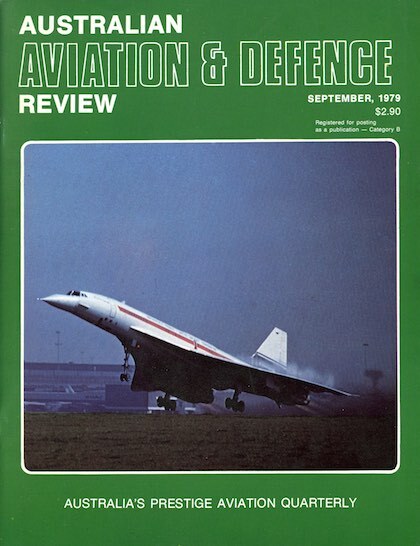 By the mid seventies I was entering my latter twenties and an avid reader of Major Peter Young’s excellent Pacific Defence Reporter as well as a number of other aviation mags of the era. Already involved in publishing, the idea of a quality annual on all things Australian aviation came to me one night in bed. Yes, just like in the movies! I did the usual feasibility study that we would on any new magazine, although many of my major business decisions over the decades have been based on ‘gut instinct’, and I had a clear sense that we could make a go of an aviation publication. My then wife Margaret and I enlisted the support of the printer and the newsagent distributor and so were able to start what is now AA on a shoestring, but if it failed, well, there went the house! 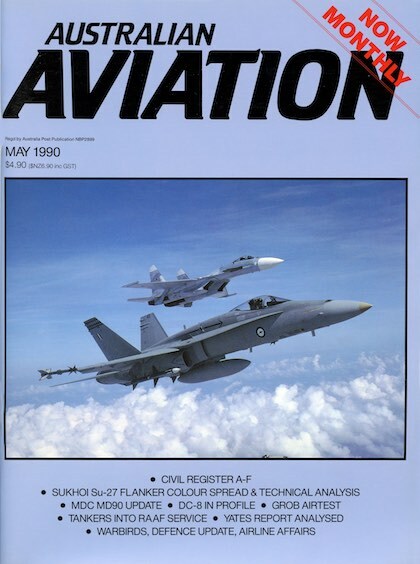 At the time the only local aviation magazine was, I felt, of exceptionally poor quality yet had an audited circulation of 4500 copies, all I really needed to break even. This gave me great confidence as I knew our level of quality would be far superior. Sometimes I have been wrong but on this occasion it all turned out better than hoped with above expected sales. We were in business. That recap is a bit like describing the history of the Second World War as ‘something that started in 1939 and ended in 1945’, but it does give a flavour to the background of the magazine. 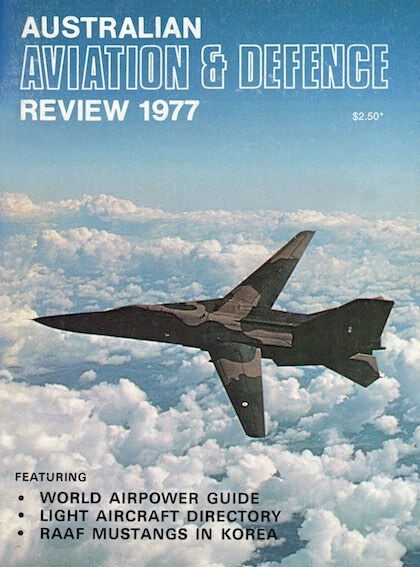 The very first issue of the then Australian Aviation and Defence Review was published in September 1977. Remarkably, as the first edition of AADR was going to press I really became concerned that there would be nothing to put in next year’s edition! Maybe I had already written about all there was to report on in the foreseeable future and there was nothing more to cover? But to be honest not continuing on that basis would have to be one of my dumbest moments, as there never was an issue of AA at any time that didn’t have articles dropped due lack of space. The second annual in 1978 in fact turned out to be a third larger than its forebear and yes, articles were dropped from it. Indeed the late 1970s provided much to report on. In the airline world Australia’s Two Airline Policy was in its heyday, stifling innovation, made even more absurd by the growing number of jets and the public’s growing disdain for parallel scheduling and inflexible and expensive fares. The Fokker Friendship had transformed regional aviation though the obvious need for smaller more efficient propliners wasn’t to be realised for almost another decade. TAA was evaluating the brand new Airbus A300 widebody twinjet, while Boeing was still contemplating what to do in response as were rivals Lockheed and Douglas. The latter two ultimately decided to do nothing while Boeing launched the 757 and 767 together in mid 1978 as a response to the growing threat from Europe. Qantas was in the final stages of phasing out 707 operations and looking to become an all 747 airline, something that would end in tears as recession inevitably approached. One interesting memory I have of that time was seeing the first Embraer Bandeirantes imported into Australia in their new Masling liveries at KSA and wondering how they would be accepted. At the time the Brazilian government was already stating to anyone who would listen that Embraer was to be taken seriously and was the beginning of something big. Meanwhile, at home we were still arguing about what colour to paint the Nomad demonstrator. Sad. Very sad. Much was also happening in the military scene. In that first annual we reported in-depth on the RAAF Mirage, Aermacchi jet trainer and Caribou replacement programs. You’ve gotta laugh, right? The Mirage was ultimately, more than half a decade later, replaced by what in 1977 was a paper aeroplane, while the Macchi replacement didn’t enter service until some 20 years later. As for the venerable Caribou, the program still breathes and, ironically, seems likely to be replaced by the C-27J, a modernised development of the Aeritalia G.222, which back in the late 1970s was seen as a Caribou replacement contender. The more things change the more they stay the same! One noted advertiser in the first AADR was British Aerospace with its then much derided Sea Harrier. At the time the RAN was debating whether to replace HMAS Melbourne with another large fixed-wing aircraft carrier or to invest in a smaller platform suitable for the new navalised Sea Harrier. Navy was also looking to replace its Daring class destroyers and River class frigates and naval helicopters loomed large on the horizon as both these types would carry helicopters. In retrospect, it has always been this writer’s humble view that the helo we should have ordered for the FFGs and later the Anzacs was the tough little battle proven Westland Lynx. Instead we purchased the hugely expensive Seahawks, which didn’t formally enter formal service until the final of six FFGs had been in the water half a decade. And the less said about the ongoing Super Seasprite debacle the better. The real bright spot, and the major difference between the eras, was General Aviation. Go to Bankstown, Archerfield or Moorabbin in the late 1970s and you had to virtually stand in line for your flying lesson. The atmosphere at all of our GA airports was electric with a veritable air force of lighties constantly working the circuit. GA was booming both here and overseas and the US factories were churning out as many as 17,000 airframes a year against less than a fifth of that today! I remember through the early years of the magazine attending new GA model launches every few months. Airtests of new types came thick and fast and I got to fly in a wide variety of types that I only previously dreamt of. To see what happened to the GA environment through the 1980s and ’90s is tragic and, quite honestly, heart breaking. The only bright spot is the recent resurgence of grass roots aviation through recreational and light sport aircraft, a field largely free of CASA’s never ending bureaucracy. From its humble beginnings AA grew rapidly and went quarterly from late 1979, bimonthly in 1985 (the same year we relocated to Canberra) and ‘monthly’ from 1990. In all those years it has always been the largest selling aviation magazine in the region and with the credibility of an audited circulation to boot. We also ventured into book production from 1987 and in the following decade and a half produced a total of 60 titles. And all this came from a small group of less than half a dozen people, for the most part from what was a converted garage in suburban Canberra operating on a very modest budget. Australian Aviation moved to a monthly frequency in 1990. Then in the mid-late nineties AA was also one of the first magazines in the world to launch a website. I am indeed very proud of what AA was and what it became. I am also very proud of something else and that’s that when I researched for this story, all the research data I needed was readily at hand via the many books we had published. Australia’s entire aviation history is now professionally documented at both civil and military levels thanks to the excellent efforts over the years of such writers as Stewart Wilson, Macarthur Job, Eric Allen, Steve Eather and more latterly Gerard Frawley. In fact one of my current volunteer jobs is working with the research centre in the Online Gallery at the Australian War Memorial and many of the books that AA has produced are used constantly as reference material when we are helping people research their family histories. All concerned can take that as a gold plated compliment. Whether it was accurately documenting the past or reporting on the present and perhaps surmising the future, your aviation magazine has always been the one to beat. May it always remain so. Of all the things that have changed these past 30 years the technology used to put AA together has advanced even more profoundly than that found in aviation. I will run you through how it was done in 1977 and you can be the judge. Each article was written on a standard typewriter. Mine was a cherished plastic portable. Typing mistakes were removed laboriously (well, kinda sorta) via Tippex. One positive of this was that writers of the era certainly quickly learnt to spell correctly and write concisely as removing errors was a tedious and boring task. You then sent the typed copy to the printery’s typesetting division to be retyped into their first generation computers (a big deal in those days, vast forbidding looking machines occupying refrigerated rooms and with the firepower of today’s mobile phone) by typesetters who worked in a mysterious language known only to them. This returned several days later in the form of photocopied galleys formatted to the size you required. Naturally the photocopy paper was that awful heat sensitive stuff, not real paper that was easier to read and work with. From here I would proof read the galleys, marking up the plethora of literals. The theory was that these would return and be cleansed of errors. But the trouble was that in most cases the typesetters would see a single error in a paragraph and retype the entire para as it was often too complex to change just one word. Mostly this would fix the original error but create another one that you didn’t always pick up or didn’t then have time to correct. Great! Finally the clean galley proofs would be (and I am for real here) hand cut with scissors and overlaid onto preprinted dummies of your magazine page with the text border and column areas marked by thin light blue lines. You then set up the layout in this way leaving space for pics and naturally the title. Letraset was in its infancy and this helped make up some interesting titles. And yes, all this was affixed to the magazine pages using Clag glue. To accompany each article you enclosed the pics with measurements and their captions with each pic and cap marked in alphabetical order. To make it easier it was ops normal to photocopy the picture and cut a portion of the photocopied pic out to glue into the designated space in the layout for identification purposes. At times some of the people at the printery could be well, incredibly dumb, and think that was what you wanted and the final proof would come back with a portion of a wing, canopy or person’s head there instead of the real thing. Incredible! When all this was done it was time to do the pagination where you allocated all the articles, ads and whatnot to fill the exact number of pages you had available and in precise order. This was always a mental challenge of extreme proportions, but the best thing about producing an annual was that you only had to do one pagination each year. All this took weeks and much patience and it was a good idea to visit the printery and work with the compositor in the final stages to ensure he was on the same page as you regarding the ultimate feel and look of each layout. I have got to say, though, that these were great times and one of the best things about being involved with AA was doing all this by hand. It never seemed the same when it was fully computerised from the mid nineties and though it was a zillion times faster and more exact it lacked that hands on feel of using a biro, ruler and doing all those measurements by hand. Then again, maybe I’m just old fashioned. September 1979 Australian Aviation and Defence Review. The end product was not that different to today except that now, via then undreamt of printing technology advances, we have affordable full colour, greater paper choices and news of course is much more current as production times have come down from weeks to days and days to hours. Then again, the cost of a bottle of Clag, my little portable, some Tippex, a ruler and a blue biro certainly left me with a lot of change versus the later era of having to buy then expensive computers and software, go to training courses that left you a major in endemic confusion and then upgrade the lot just three or four years later when it was deemed ‘obsolete’. I am indeed fortunate to have experienced it all first hand. The 40th anniversary of Australian Aviation will be celebrated in the September 2017 edition of the magazine with a series of feature articles inspired by the features in our very first issue. 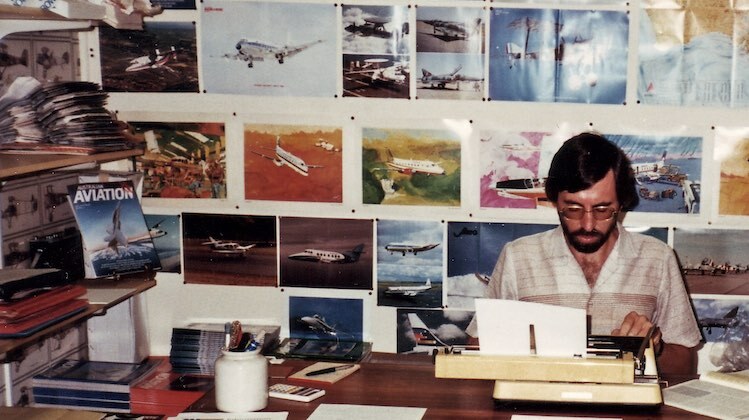 That is our way of paying tribute to that very first edition, and to Jim’s entrepreneurial spirit in risking his life’s savings to establish a new aviation magazine. But it is also our way of highlighting the broad range of topics Australian Aviation has covered in our 40 years, how much aviation has changed in that time, and, perhaps surprisingly, how much remains the same as well. The September 2017 issue goes on sale in Australia on August 31, while subscribers will receive their magazines from August 24 onwards. 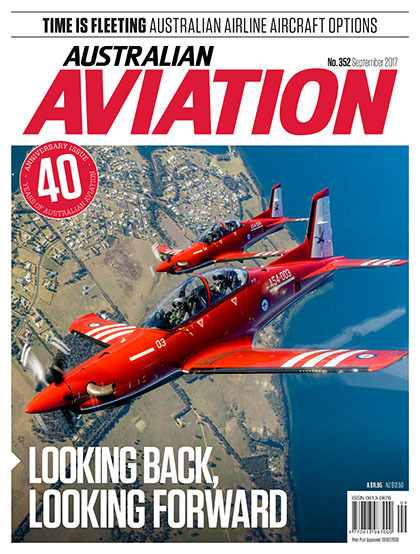 The 40th anniversary issue of Australian Aviation. Well done AA. I admire your achievements and the hard work you all put in. Cheers to AA and all readers.